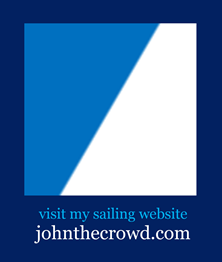 John Crowd | johncrowd.com | sailor's blog: America's Cup, Oracle Team USA or Emirates Team New Zealand, who will win? America's Cup, Oracle Team USA or Emirates Team New Zealand, who will win? America's Cup, Oracle Team USA: Nail-Biting, the America's Cup Is Not - WSJ.com: "When the America's Cup finals start Saturday, defending champion Oracle Team USA will begin the first-to-nine-wins series with negative-two victories. That is its punishment for illegally adding weights to boats in less-prestigious races more than a year ago. But if history holds its course, the penalty might not even matter: The vast majority of finals have been sweeps. . . ."
As the article referenced above points out, most America's Cup events end up a sweep by the winner, as the "fastest boat" almost always wins (unlike the Olympics where everyone sails the same boat), which puts a premium on boat design and as a result, many innovations have come from America's Cup races. This year, the AC72s are awesome, and a bit terrifying to sail--some say even dangerous--having taken the life of Olympic sailor Bart Simpson in a tragic accident on San Francisco Bay this past spring. We may never see these boats sailed again in an America's Cup. But competitive sailing catamarans, foiling (airborne on foils), in races on bays or close to shore where spectators have a ring-side seat, are probably here to stay. The AC45s (used in the lead-up World Series races last year) appear to be a safer and less expensive alternative for future America's Cup races. So who looks to take it all away and emerge victorious? We will all probably have a pretty good idea after the initial races Saturday and Sunday, but having watched both teams, I would favor the Kiwis (Emirates Team New Zealand) to take back to Auckland the Auld Mug.